Online. In person. For less. Sign up by 4/19 to save. Build career-advancing skills through expert-led blended courses that get you ahead fast. 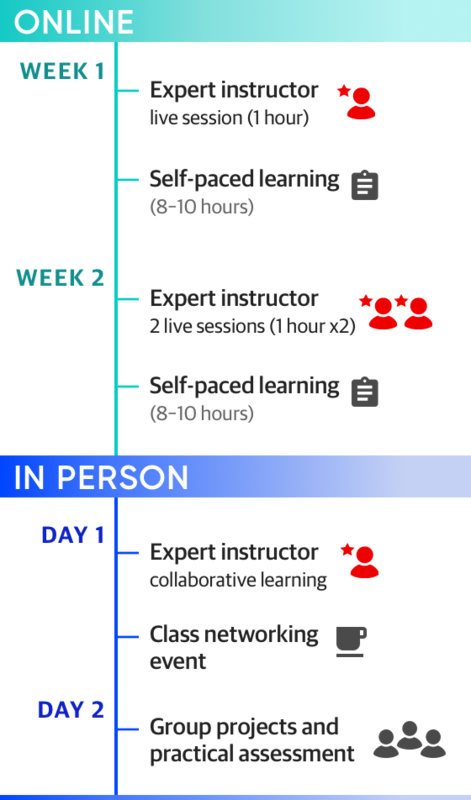 Every course is developed to minimize the time you’re out of office—and maximize what you learn. The two-week online portion includes live sessions with your instructor for a thorough understanding of core concepts and ideas. So when you arrive at the two-day in-person session, you can hit the ground running with a like-minded group of dedicated professionals. When you complete each three-course series and pass a practical assessment exam, you’ll receive a Pro Series by O’Reilly certificate. Backed by our 40-year reputation for technical excellence, this certificate demonstrates that you can apply the skills you’ve learned to on-the-job problems. Are you more experienced? Jump right to the final course in a series, then pass the cumulative practical assessment exam to earn your certificate. Transform data into actionable insights and knowledge. Improve your analytical thinking, ask the right questions, and solve problems iteratively. Learn to tell data-driven stories so you can teach your organization how to give its products and customers an edge over the competition.